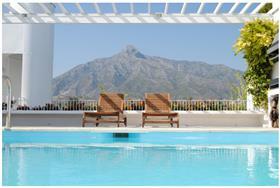 We have a wide choice of apartments in Marbella - many of which are located in the town centre. An apartment makes for an attractive option for holiday accommodation as they are cheaper than villas but also allow you to get closer to the shops, bars and restaurants without the need to drive everywhere. We have a wide choice of apartments to rent in Marbella Marina. We also have many other apartments on the outskirts of the town where it tends to be a lot quieter than in the town. Most of our apartments have English Sky TV or German, French channels. Some have air conditioning too and of course the communal pools. Luxury apartment with private pool on the terrace! Marbella is an excellent place to stay for families. The town hall is one of the richest on the coast and as such you will notice that they are happy to spend alot of money on the various plants and shrubs that are planted throughout the town. There are some oood beaches including a good beach for young chldren next to Mrbella Sports Marina. This particular bay is very shallow water and is very sheltered. There are a couple of chringitos on this beach.